The announcement was made March 17 during a joint press conference during TMC’s annual meeting. 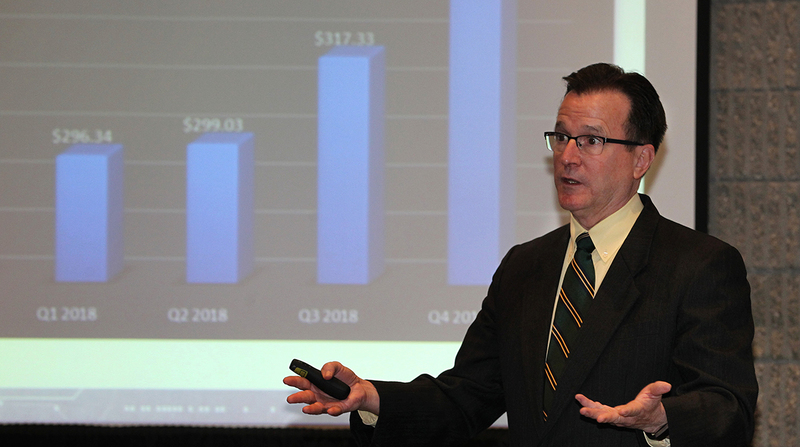 The BenchMarkit program — launched at TMC’s 2018 annual meeting — during its first year collected data on roadside breakdowns for truckload fleets. To participate, a fleet must agree to provide data on all roadside breakdowns and use TMC’s Vehicle Maintenance Reporting Standards to code all incidents, said Jim Buell, FleetNet’s executive vice president of sales and marketing. So, the 4Q 2018 best-in-class performance of more than 75,000 miles really caught his eye. Buell added, “I don’t know where the ceiling is, but I do know that this industry — the truckload vertical — should not be breaking down every 10,000 miles. Fewer breakdowns, Buell noted, could help offset maintenance costs that program data indicate are on the rise. In 4Q 2018, the average cost per mechanical repair reached $334.20, its highest level since the benchmarking program launched. The cost was $311.37 in 4Q 2017, then dropped to $296.34 in 1Q 2018. The number then increased each quarter for the rest of that year, to $299.03 in 2Q and $317.33 in 3Q. The largest cost increase among the top 10 VMRS systems during the program’s first year included lighting (+12%); cab and sheet metal (+8%) and trim and miscellaneous hardware (+36%), the two reported. TMC Executive Director Robert Braswell noted that BenchMarkit is a benefit for TMC members. According to Buell, the program has enough data to expand into less-than-truckload and tanker fleets.